Refine and decongest your complexion with the Yes To Tomatoes Clearing Facial Mask, a deep pore treatment that works to purify and detoxify skin. Utilising 95% natural ingredients, including antioxidant-rich Tomato, the clarifying face mask gently draws out impurities from clogged pores whilst fighting free radicals and absorbing sebum to help prevent breakouts. Its balancing properties will leave skin feeling fresh, clear, purified and moisturised. 95% Natural. Paraben, petroleum, SLS and cruelty-free. Apply a thin layer to your clean, smiling face. Use a circular motion to thoroughly cover your face, avoiding your mouth and eyes. Gently wipe away with a damp washcloth after about 5 minutes. Refresh your gorgeous self with a splash of cool water and pat dry. Aqua (Water), Kaolin, Glycerin, Prunus Amygdalus Dulcis (Sweet Almond) Oil, Aveena Sativa (Oat) Kernel Meal, Titanium Dioxide, Caprylic/capric Triglyceride, Magnesium Aluminum INGREDIENTS / INGR?DIENTS Aqua, Kaolin, Glycerin, Prunus Amygdalus Dulcis Oil, Caprylic/Capric Triglyceride, Titanium Dioxide, Avena Sativa Kernel Meal, Magnesium Aluminum Silicate, Aloe Barbadensis Leaf Juice*, Bentonite, Phenoxyethanol, Potassium Sorbate, Cetearyl Alcohol, Zinc Oxide, Persea Gratissima Oil*, Simmondsia Chinensis Seed Oil*, Tocopherol, Capsicum Annuum Fruit Extract, Cucurbita Pepo Fruit Extract*, Solanum Lycopersicum Fruit Extract*, Ginkgo Biloba Leaf Extract*, Aspalathus Linearis Extract*, Chamomilla Recutita Flower Extract*, Alcohol, Citrullus Vulgaris Fruit Extract, Silt, Parfum, Citric Acid. *Certified Organic Ingredient. 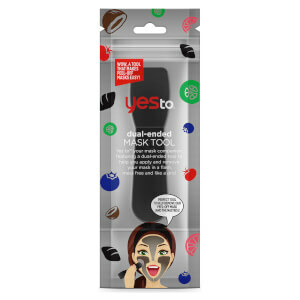 Receive a FREE Yesto Mask Tool when you spend £10 on YesTo.